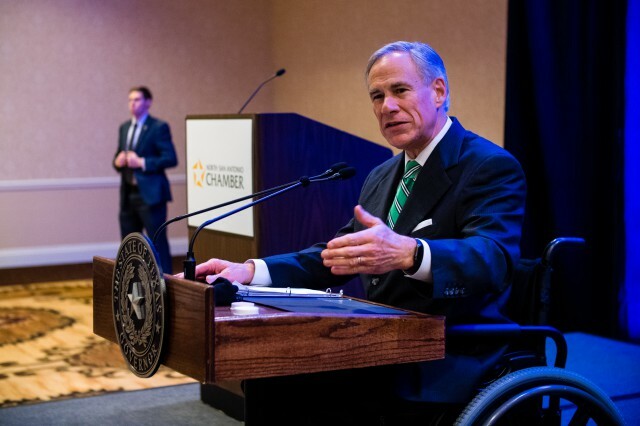 Governor Greg Abbott today delivered remarks at the North San Antonio Chamber Of Commerce Luncheon in San Antonio as part of his State of the State tour. The Governor discussed his commitment to reining in property tax growth and fostering a friendly business climate in Texas. He also spoke on the need to prioritize school finance reform and implement strategies to improve student outcomes throughout the state. "What I have discussed today just scratches the surface of what we will accomplish this session," said Governor Abbott. "No doubt, we are advancing a bold agenda that can transform the state of Texas. I’m grateful to business leaders like you for being a part of this transformation by charting a new path for the Texas economy. By prioritizing both school finance and property tax reform, we will usher in a new era of prosperity for Texas." Founded in 1974, the North San Antonio Chamber Of Commerce represents over 1,200 member businesses throughout the city of San Antonio. This is Governor Abbott's second stop on his State of the State tour throughout Texas. He previously visited the Richardson Chamber of Commerce and will visit Houston next week.